Highly anticipated new album from Australian pop disciples The Steinbecks, the band led by former Sugargliders Josh and Joel Meadows. The Steinbecks emerged from the ashes of The Sugargliders after the ’gliders released ten 7” singles on legendary pop labels Sarah Records in England and Summershine Records in Australia. The Meadows brothers write emotionally honest pop songs about the world as they experience it, and record them with multi-instrumentalists Matt Sigley (Earthmen, Daytime Frequency), Joseph Bromley, and Jerry Rinse. 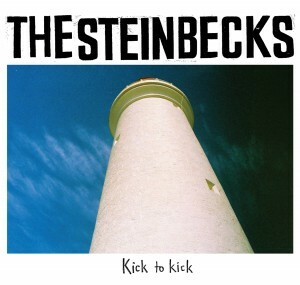 ‘Kick To Kick With The Steinbecks’ is the band’s first album since ‘Far From The Madding Crowd’ in 2007 and features 12 new recordings that deliver an especially dynamic listening experience. ‘Below the Limen’ has a touch of 'Abbey Road' or 'Odessey & Oracle' with its intricate bassline and whirring Vox Continental organ. Even the words could have come from the late ’60s, as the ’becks urge the listener to explore subliminal thoughts and re-connect with the natural world. The album’s most fragile three minutes come in ‘Semblance of Hope’, during which Joel breathes a sigh of relief over his narrow escape from suburbia (“you could have taken my best years”) and in falsetto begs his sweetheart to “stay with me and watch while the sun sets its gold at the hillside”. A slow, sparse, stunning ballad. Part list song, part social commentary, part soapbox rant, ‘I, Radio’ is ultimately a passionate love song to the wireless. Joel talks/sings/shouts about his childhood experiences of the radio, the thrill of Top 40, the discovery of underground radio, and the bands that changed his life. ‘Cold Little Bones’ is all woody and organic—mandolin, double bass, melodica and unaffected vocals tread the twisted pathways the mind wanders while waiting too long for someone to come home. ‘Trying To Be Someone’, written by drummer Bromley, is a driving pop song that wouldn’t have been out of place on the classic 'Meat is Murder' album from The Smiths. As electric guitars jangle, then riff, then nearly spiral out of control, Josh sings of isolation, rejection, and the search for identity and authenticity. On ‘Through the Curtain’ Matt Sigley weaves an irresistible bassline and Joel has a go at Flamenco guitar playing, as he used to on occasion in The Sugargliders. The song’s message? When romance lets you down you can always fall back on the romance of music. ‘Burning Holes in the Sun’ features Matt Sigley and Jerry Rinse locking into a bass and drum groove that nods to Neu!, but Joel’s guitar solo owes more to Ace Frehley than indie influences. Meanwhile, Josh agonises over “watching Bathsheba and catching fear”. Somehow it all comes together in a tight, infectious, memorable track. ‘Burning Holes (reprise)’ takes some of the same lyrics from the previous song, but sets them to a completely different piece of music. The listener is transported to an after-midnight ’60s club where the band has settled into a slow groove and a Spanish guitarist is lazily riffing from the stage. The title track and album closer, ‘Kick to Kick’ is the Meadows brothers’ tribute to a complicated, much-loved cousin, who died too young and left a lasting impression. It’s electric guitar pop in the vein of the Lemonheads, Blake Babies and Teenage Fanclub. Housed in a handsome gatefold eco-wallet, ‘Kick to Kick’ is a very welcome return for The Steinbecks and an absolute score for the Matinée discography.